A Loose Bobbin: Exciting News! "I am pleased to inform you that your entry has been accepted in the CQA/ACC National Juried Show 2013"
Let's just say, I spent 20 minutes dancing around the house! Now I just have to calm down enough to fill in the required additional documents and figure out how to package the quilt so that it arrives safely for display. 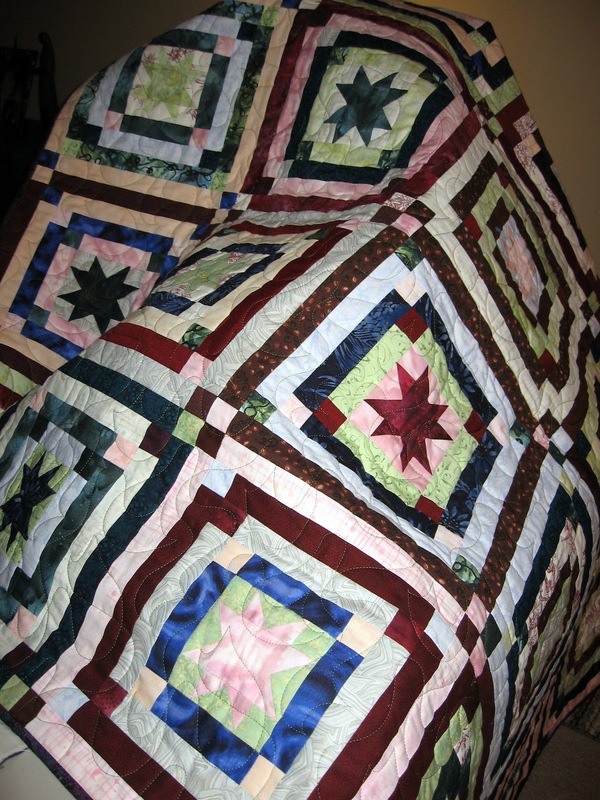 On another note, I finished up a quilt that consists of blocks made by some friends. Here is a picture. I've called it Scraps of Value. Each of us were given instructions to select dark and light scraps; we could choose any colour and had to precut our scraps to predetermined sizes. We also didn't know what colours the others had chosen, nor were we given the pattern for the block until we got together. After setting all of our pieces out to share, we discovered that the majority of the colours chosen were within the "cool" spectrum. We were given block piecing instructions and each of us made a "dark" and "light" block. Here is a closer picture of what I mean. Look closely... the block with the dark star has a dark border; the light star, a light border. Initially we thought that the blocks wouldn't work well together, but when put up on the design wall all of us noted it was the value that created the pattern. Of course it helped and was an added bonus that we had picked colours from the cool side of the colour wheel, but I think it would have worked even with multi colours. It just would have projected a more vibrant mood rather than the calm one these blocks did. Its the value that did the work! Who would have "thunk" it. Congratulations on having your quilt entered in a National Show! and good luck in the judging! Your friendship quilt is gorgeous - quite amazing how blocks made by many different people can go together so well - it's a beautiful quilt! Congratulations on your entry! 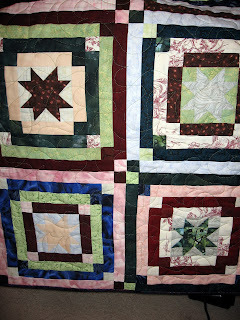 Love the values of the quilt pictured. Congratulations! What a compliment! Love the friendship quilt, too! Congratulations! How exciting for you. Congratulations! Very exciting. Will you be attending the NJS? Just wait till you see your work hanging along with other fabulous pieces from across the country....you will be smiling for weeks! That is so flippin' exciting! You are going right? I will take your pic of you standing right beside your quilt... awesome!!!!! Excellent news!!! Congrats!!! 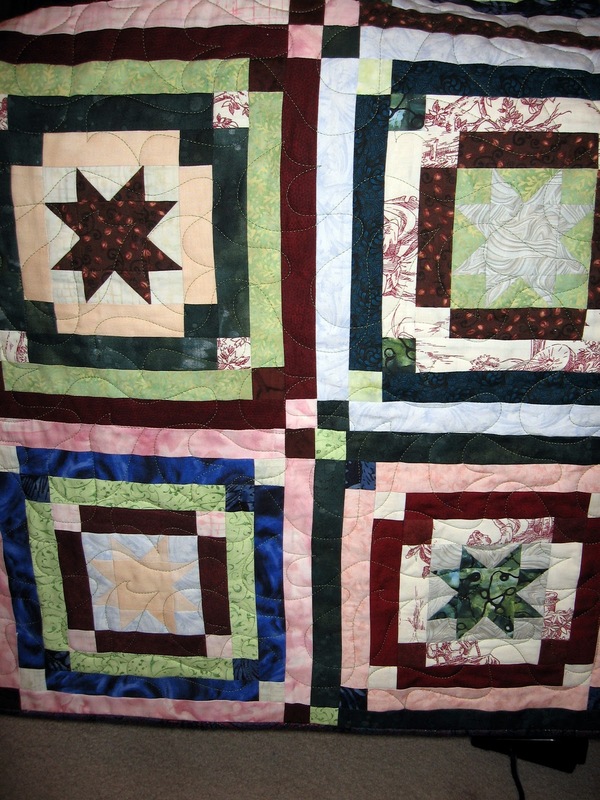 Your quilts are top notch, good luck in the show! yay!!! Doing a happy dance right along with you! Congrats! Congratulations on your quilt show entry. Way to go!! How exciting! !